You should now have 4 new files and a “mods” folder in your sonic generation game folder. Now unzip the Nights mod you chose. We will use the Nights Fly mod for example. Inside unzipped Nights(with fly) is folder “NIGHTS”. Copy that folder to the inside “mods” folder in your sonic generations game folder. 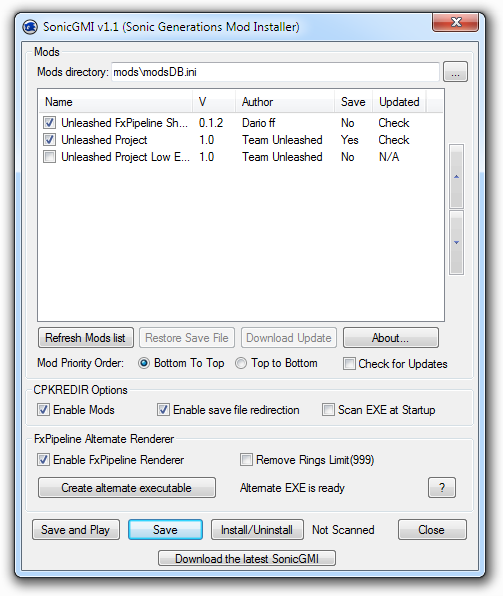 First enable mods by clicking the install/uninstall button and it should say mods enabled. Next click the checkbox of the mod you want in the mods window and hit the save button. Close with the close button and start the game.